Below you can find detailed information about our key exam results for both GCSE and GCE level and the progression of our Year 11 and Year 13 students after they have completed their exams. 2018 saw a significant increase in Blenheim’s GCSE results. 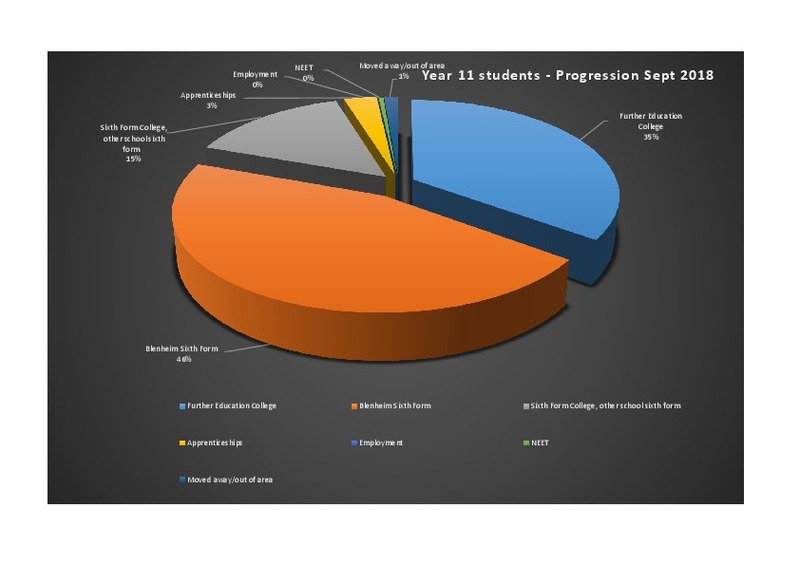 A combination of well researched teaching and learning practices, rhythmical assessment and feedback, frequent reporting, well timed interventions and consistent monitoring of student performance led to increases in almost all areas of GCSE performance. This improved performance compares favourably with both Blenheim’s 2017 GCSE results and 2018 National GCSE results. In 2017, apart from Maths and English, grades were attributed A* - G grades with A* - C being considered ‘higher’ grades or passes. In 2018 all subjects (bar a minority) were attributed 9 – 1 grades with 9 – 4 being considered ‘higher’ grades or passes. The Sixth Form at Blenheim provides a vibrant learning environment for post 16 students in dedicated accommodation. Sixth Formers benefit from their own exclusive reception, student entrance, cafe and study area. Excellence and opportunity – Students excelled at A Level in a diverse range of subjects including Drama, English Literature, Film Studies, French, Geography, History, ICT, Product Design, Psychology, Philosophy & Ethics, Sociology, BTECs in Health & Social Care and Travel & Tourism and the Extended Project Qualification. We also have the Chelsea Girls’ Football Academy based at Blenheim High School. 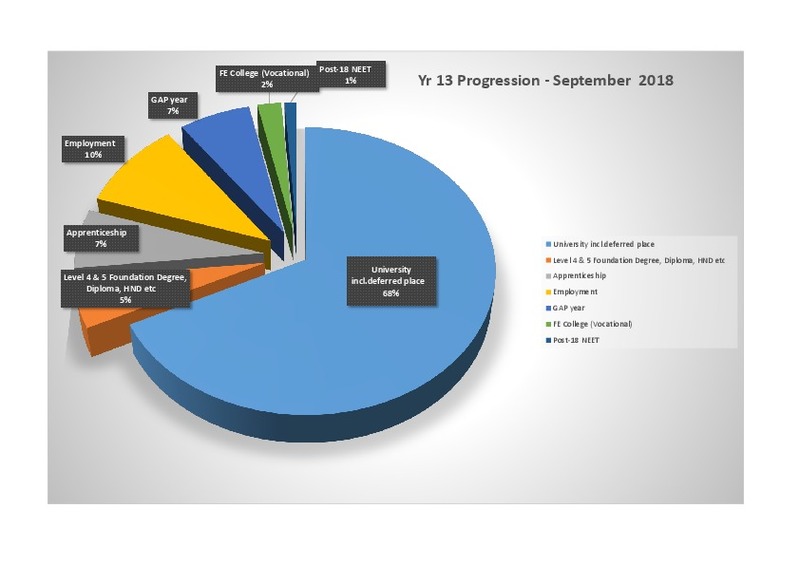 Progression for all - With the support of a highly experienced team of Sixth Form staff and a dedicated careers advisor, 82% of Year 13 students were successful in securing first choice university places. Our students secured places at Birmingham, Bristol, Cardiff, Durham, Exeter, Kings, Loughborough, Leeds, Manchester, Oxford, Sheffield, Sussex, Surrey and UCL.One student secured Higher Apprenticeship with Jaguar Land Rover based in Warwick. The Extended Day – From this September, Year 13 students have the extended day as a daily addition to their timetable where extra lessons are timetabled onto the end of the normal six period day. These lessons provide students with the opportunity to clarify any difficult concepts from lessons as well as affording teachers the opportunity to work with students who may have fallen behind in their learning, thus allowing them to ‘catch up’. Separate clinics are also run by The Sixth Form leadership team for students who may have AS work to revise or who need help in adopting the sort of practices that are required to properly engage with A level study. At Blenheim, we work tirelessly to support our students particularly at the very important transition times in Years 11 and 13. A comprehensive careers education programme is delivered to all students from Yr 7 to Yr 13. In addition, students and parents have access to quality impartial careers information, advice and guidance. Our aim is to ensure that each student achieves the best they can and moves on to the most appropriate progression pathway. We promote aspiration and the value of continuing in education or training. We have a partnership with SCC/U-Explore to provide additional targeted support for selected students. We are also proud to hold the quality standard award Investors in Careers, this acknowledges the excellence of the CEIAG provided by the school. For further information for Careers Education, Information, Advice and Guidance follow the link. * The proportion of 16 -24 year olds NEET (Not in Education, Employment or Training) figure for 16-18 Nationally is 8.4% for the quarter April to June 2017 in England.